From start to finish, No. 12 Florida State’s experience, athleticism and skill were on full display. 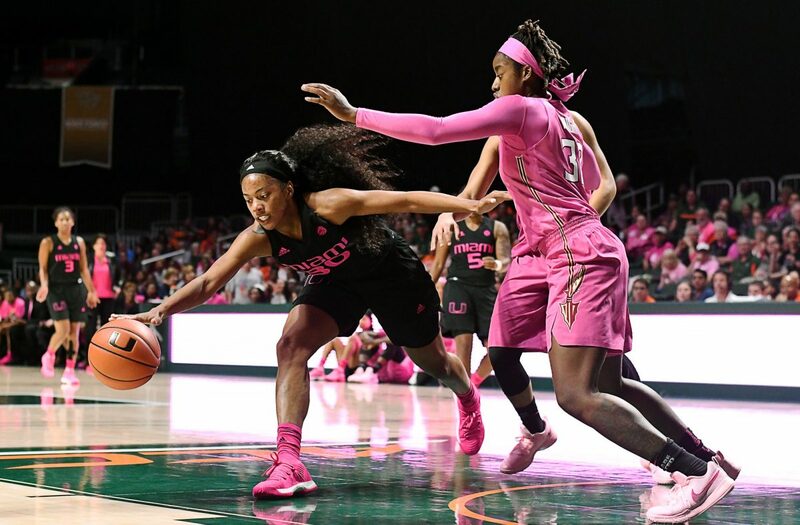 The Seminoles led for all but 34 seconds, dominating the Miami Hurricanes 91-71 on Sunday, Feb. 11, afternoon at the Watsco Center as part of the annual Play4Kay game. Florida State (21-4, 8-3 ACC) shot an efficient 55 percent from the field and finished with four players scoring in double-figures. Senior guard Imani Wright led the way for the Noles, scoring 21 points and making four three-pointers, while fellow senior Shakayla Thomas tallied 19 points and five rebounds. Sophomore guard Nausia Woolfolk finished one rebound shy of a triple-double, collecting 16 points, 10 assists and nine rebounds off the bench. Senior center Chatrice White notched 14 points and five rebounds. The Hurricanes (17-8, 7-5 ACC) kept pace with the Seminoles in the opening minutes, but then Florida State took over. FSU opened the second quarter on a 16-2 run, ultimately taking a 52-36 advantage into halftime. Florida State shot 57 percent from the field in the first half compared to 44-percent shooting for Miami. The Noles owned the glass with a 43-29 advantage, leading to a 12-3 margin in second-chance points. Miami senior forward Erykah Davenport tallied her ninth double-double of the season, finishing with 21 points and 12 rebounds, while fellow senior forward Keyanna “Keke” Harris collected 13 points. Freshman guard Kelsey Marshall added 10 points. With the loss, Miami fell to a 14-43 all-time record against Florida State. The Seminoles’ victory marks coach Sue Semrau’s 400th win of her career. While the two rivals have gone head-to-head on the hardwood twice this season, the game on Sunday was bigger than basketball. The Canes will return to action when they host Pittsburgh at 7 p.m. Feb. 15 at the Watsco Center. Florida State returns home to face Clemson at 7 p.m. Feb. 15 at the Donald L. Tucker Civic Center. Donna Shalala to become member of Congress?